The IAB released new research examining consumption of media on a regular basis. The study, titled Personal Prime Time, included questions about how and why respondents chose to engage with that type of media. The section on podcasts reveals some useful demographic data and motivations for when people listen. Overall, 17% of the total respondent base said they listen to podcasts. Men posted 20% and women resulted in 15%. The rates also varied by age, with the 18-34 bracket at 28%, 35-54 at 23%, and over-55 at just 7%. More than half (51%) of consumers who regularly listen to podcasts do so multiple times in a typical weekday. 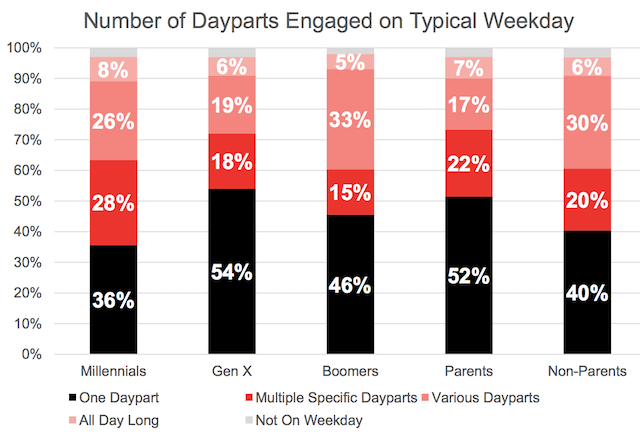 Forty-six percent focus their podcast time to a single daypart. The most common among those were afternoon at 21% and evening at 20%. Podcast listeners reported peaks in their level of concentration depending on time of day. Those who listen in the early evening had the highest degree of concentration paid to the podcast at 75%, followed by evening at 72% concentration. Afternoon and late morning had the lowest rates with 61% and 62%, respectively. 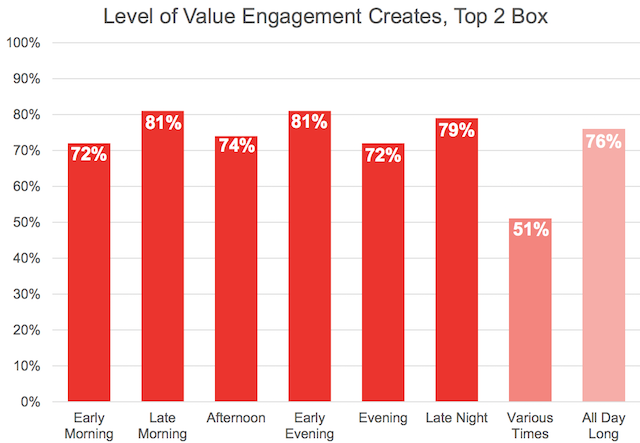 However, the level of value reported by listeners was more consistently high, ranging from 72% to 81% across the dayparts. The IAB also inquired as to the needs being filled by podcast consumption. The top reasons across the day are to learn and to be entertained. Getting information was another frequently reported need, especially for early morning listeners, and passing the time was also common, but generally at lower percentages. Mobile is the top listening platform by a hefty margin across all dayparts, with more than 60% for all options. Computers never exceeded a 50% response, but did have a dedicated set of respondents for all times except early morning. The results were obtained from an online survey with a total sample of 1,901 consumers ages 18 and up in the United States. Surveys were conducted between January 17 and January 23. There doesn’t seem to be enough variation in this data to make it meaningful, other than that people with kids listen less that people without…which we could have deduced on our own.